Welcome to our new Tyco forum! 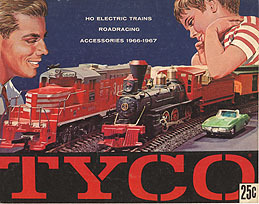 Welcome to Tyco Depot, Tyco Trains Resource and Forum for Collectors and Model Railroading. As a member here, this forum's direction belongs to you. Post your wants and suggestions and I'll do my best to give the members what they want. Welcome to Tyco Depot! Let us know a little about yourself. Grab a cup o' Joe and talk about whatever. 546 18,382 A box arrived from_________. The place for all of your Tyco motive power. 74 1,133 Windsheild for F7? The place for all of your Tyco rolling stock. 76 1,383 Post a caboose For no reason! Show off your Tyco Accessories, operation videos encouraged! Post about Tyco and other HO Trollies. Create your own personal space about your layouts and operations. Layouts and displays from clubs, museums, commercial displays etc. This is a place to post when no other category seems right. Post your prototype photos here. Show off your real rail road stuff here. Post your unknown models and accessories here for help in IDing. 115 1,403 What is this for? Here we can talk about any kind of modeling other than trains.